Django is a flexible framework for quickly creating Python applications. By default, Django applications are configured to store data into a lightweight SQLite database file. While this works well under some loads, a more traditional DBMS can improve performance in production. 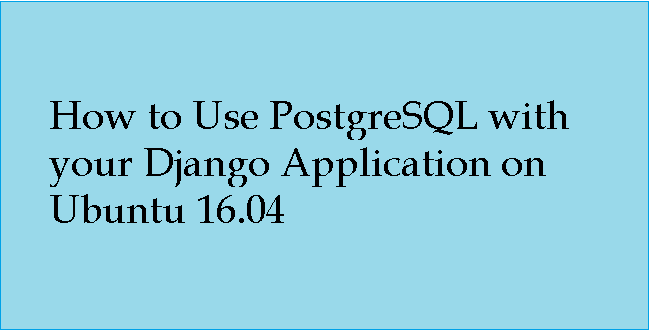 In this article, We will show you the steps to install and configure PostgreSQL to use with your Django applications. We will install the necessary software, create database credentials for our application, and then start and configure a new Django project to use this backend. To get started, you will need a clean Ubuntu 16.04 server "Bare-metal or Virtual" instance with a non-root user set up. The non-root user must be configured with sudo privileges. When you are ready to continue, log in as your sudo user and read on. Our first step will be install all of the pieces that we need from the repositories. We will install pip, the Python package manager, in order to install and manage our Python components. We will also install the database software and the associated libraries required to interact with them. Python 2 and Python 3 require slightly different packages, so choose the commands below that match the Python version of your project. With the installation out of the way, we can move on to create our database and database user. By default, Postgres uses an authentication scheme called "peer authentication" for local connections. Basically, this means that if the user's operating system username matches a valid Postgres username, that user can login with no further authentication. During the Postgres installation, an operating system user named postgres was created to correspond to the postgres PostgreSQL administrative user. We need to use this user to perform administrative tasks. We can use sudo and pass in the username with the -u option. Afterwards, we'll modify a few of the connection parameters for the user we just created. This will speed up database operations so that the correct values do not have to be queried and set each time a connection is established. We are setting the default encoding to UTF-8, which Django expects. We are also setting the default transaction isolation scheme to "read committed", which blocks reads from uncommitted transactions. Lastly, we are setting the timezone. By default, our Django projects will be set to use UTC. These are all recommendations from the Django project itself. Now that our database is set up, we can install Django. For better flexibility, we will install Django and all of its dependencies within a Python virtual environment. The virtualenv package allows you to create these environments easily. This will install a local copy of Python and a local pip command into a directory called myprojectenv within your project directory. Your prompt will change to indicate that you are now operating within the virtual environment. It will look something like this (myprojectenv)user@host:~/myproject$. (myprojectenv) $ django-admin.py startproject myproject . Now that we have a project, we need to configure it to use the database we created. This is currently configured to use SQLite as a database. We need to change this so that our PostgreSQL database is used instead. First, change the engine so that it uses the postgresql_psycopg2 adaptor instead of the sqlite3 adaptor. 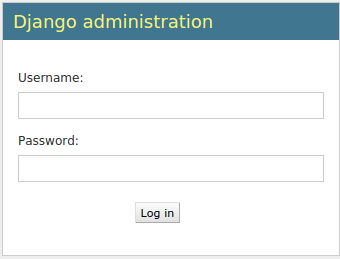 Now that the Django settings are configured, we can migrate our data structures to our database and test out the server. You will be asked to select a username, provide an email address, and choose and confirm a password for the account. If you followed the initial server setup guide, you should have a UFW firewall in place. Before we can access the Django development server to test our database, we need open the port we will be using in our firewall. When you're done investigating, you can stop the development server by hitting CTRL-C in your terminal window. By accessing the admin interface, we have confirmed that our database has stored our user account information and that it can be appropriately accessed. In above steps, we've demonstrated how to install and configure PostgreSQL as the backend database for a Django project. While SQLite can easily handle the load during development and light production use, most projects benefit from implementing a more full-featured DBMS.